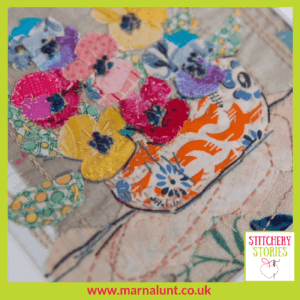 Today on the Stitchery Stories embroidery and textile art podcast, Marna Lunt shares her life in fabric & thread. 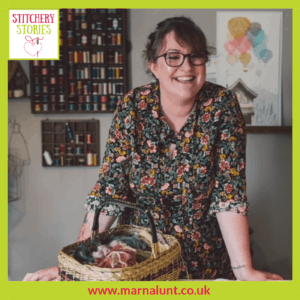 Marna is a fine artist turned hand embroidery artist who offers online embroidery courses, as well as one off original paintings, drawings, thread paintings, and contemporary embroidery. Marna shares why she moved from painting, to painting with a needle and in our conversation, classical art and art history are a recurring subject. 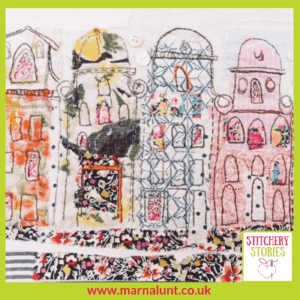 However, when family life meant that large-scale painting in oils wasn’t practical, Marna turned to fabric & thread for relaxation, therapy and to earn a living. Continue reading to discover the highlights of our chat and to see examples of Marna’s work.